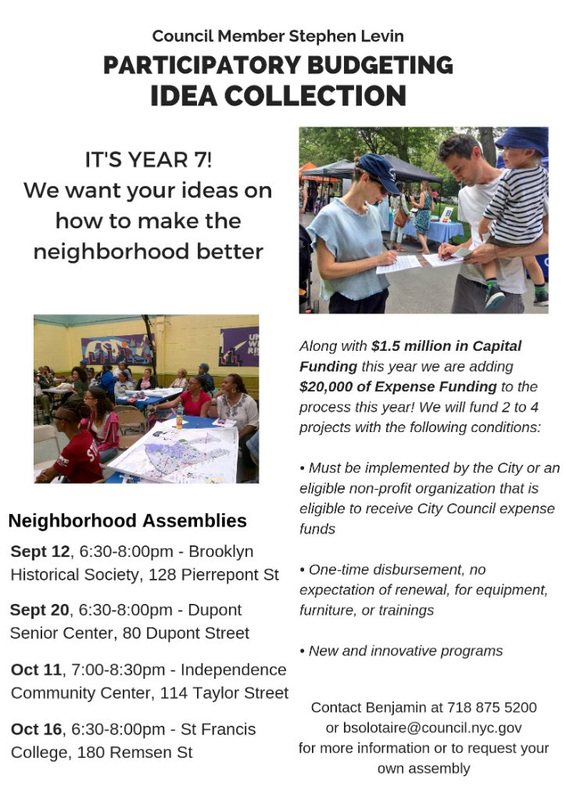 Council Member Stephen Levin wants your ideas! What needs to get fixed, does the community need something new, or how can our neighborhood be improved? This year Levin is again dedicating $1.5 million to capital projects in the district, now along with $20,000 in expense projects, that are suggested by you, developed by you, and voted on by you. Community members like you can propose and vote on projects like improvements to schools, parks, libraries, public housing, and other public or community spaces. After you submit your idea, it will be given to community volunteers, called Budget Delegates. Budget Delegates work in your district to turn ideas into real proposals for a ballot, with input from city agencies. These proposals will be up for a community-wide vote in the spring. There are two types of discretionary funds available for Participatory Budgeting. Expense funds are used to pay for salaries and services. Capital funds are used to pay for physical infrastructure — “bricks and mortar” projects, like the construction, renovation or repair of city-owned property. Expense projects between $5,000 and $10,000 will be considered. They will follow the same process as the capital projects and get voted on in April. If you can’t make this assembly on October 16th at St. Francis College or any of the other meetings listed below, you can submit ideas here. To learn more about Participatory Budgeting, click here.